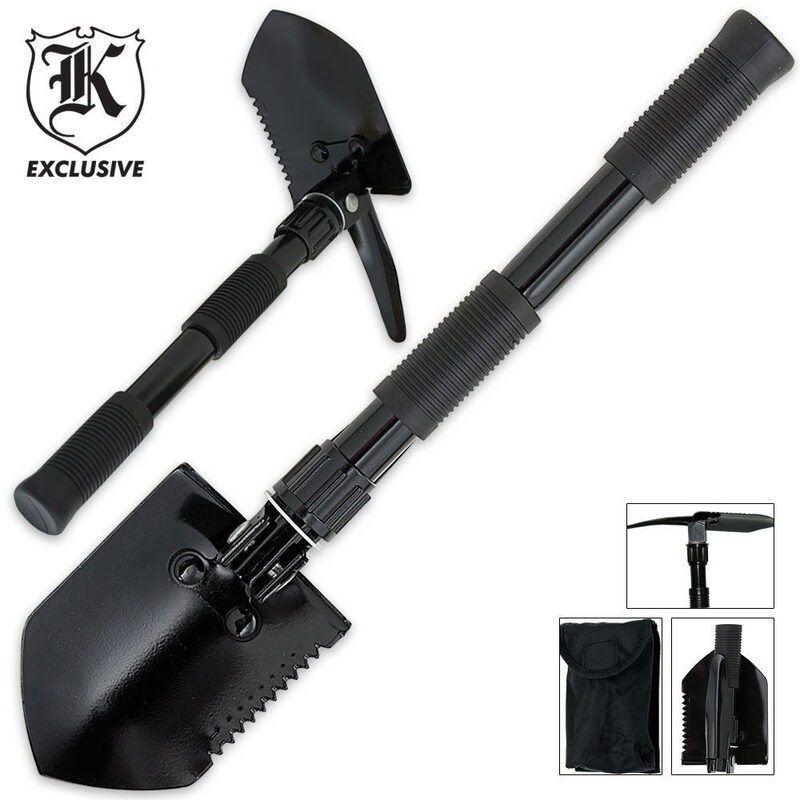 Folding Entrenching Survival Shovel Tool | BUDK.com - Knives & Swords At The Lowest Prices! 2 or more only $9.00 each! 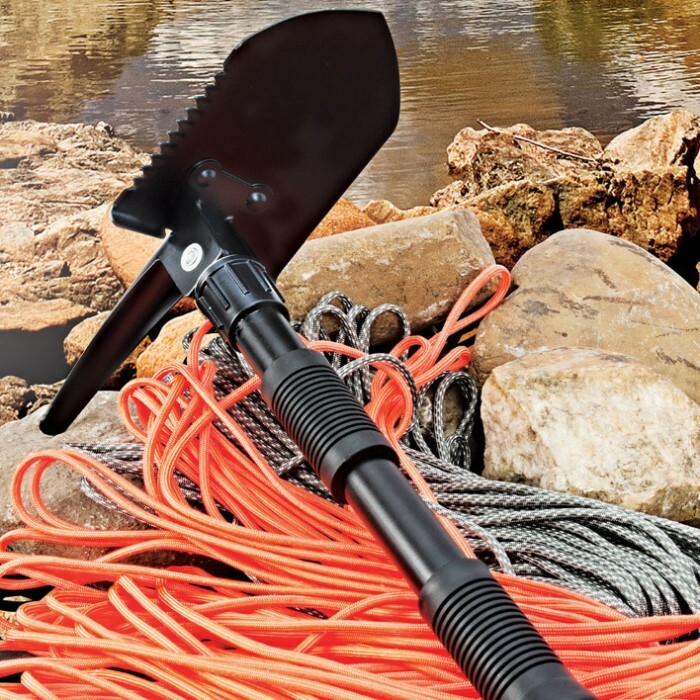 This handy camping companion offers the versatility of both a shovel and a dibble pick in one lightweight, compact tool. It features quality tempered steel construction, a space-saving folding design and a no-slip rubber grip. At 16" overall with a 5 1/4" axe head, it's amply sized for most digging and/or picking tasks, yet it fits easily in any standard backpack. Includes nylon storage pouch. Anytime I order something I buy one of these. We use them in the woods and at home, even let the kids play in the sandbox with them. I wouldn't build a fox-hole with it, but I do use them to make Dakota fire pits. This shovel was purchased as a gift for me over a year ago. I recently had the opportunity to use it, and I must say, I was impressed. I had to dig four trenches (two at 12" deep by 6' long; two at 18"x10') to expose underground electrical wiring for a home inspection (Note: I disconnected the power at the breaker, and was very careful as this tool is all steel). I began the digging with a normal shovel, but used this shovel for most of the work; it saved me a lot of time. The weakest part of this shovel is the point where the threaded shafts screw into eachother; halfway through the job the threads bent here and the shovel handle became wobbly and unable to be tightened all the way. I solved this issue by cutting back some of the rubber grip on the upper shaft and welding the two shafts together, creating one solid handle. The shovel is a lot stronger now and can handle harder blows... very much worth sacrificing it's compactibility. I pushed the middle grip down to meet the grip at the end for a larger, more reasonably-sized grip; and then I wrapped the entire handle and shaft in electrical tape to provide some insulation from electricity (NOT a safety measure to he relied upon!). My final modification will be dipping the handle in some rubber-paint-stuff for tool handles to give it a smooth, clean-looking handle (instead of one wrapped in tape). This tool seems like it will last me a long time and I look forward to using it more. I can foresee the shovelhead becoming too loose after more use, and will probably end up welding that into place, as well. I take one star because the original design doesn't work well, but leave four because it's made of good materials and is strong when the handle becomes one piece. If I didn't have access to a welder, I would have given this 2/5 stars. 6 camping trips of shoveling, hitting tent pegs in and chop small trees branch's and still good to go... Just be carefully to properly put the blades when storing and make sure you take it all out when cholling as they may dislodge.. But great for the price and did dig snow with it... It's meant for backpacking not digging a car out... Works well. When I got this little shovel I was pleasantly surprised! I loved the fact that it was so little I could carry it around my waist. Worked GREAT on my garden. I will buying more to give away as Christmas gifts. I was not sure about this tool. Looked at reviews others had written, sounded good so I ordered one. Shipped fast, When looking at this shovel and pic tool and using it fount to be very handy and compact, you can wear it on your belt with out noticing it. This is a great camping tool, exploring, hiking this would be a must to carry with me, again it's light and compact, you be glad you had it when you would need it, I pan for gold comes in really handy. Purchased to include in my tools on 5th wheel camper. Shovel/pic is small but light and well made for emergency situations. 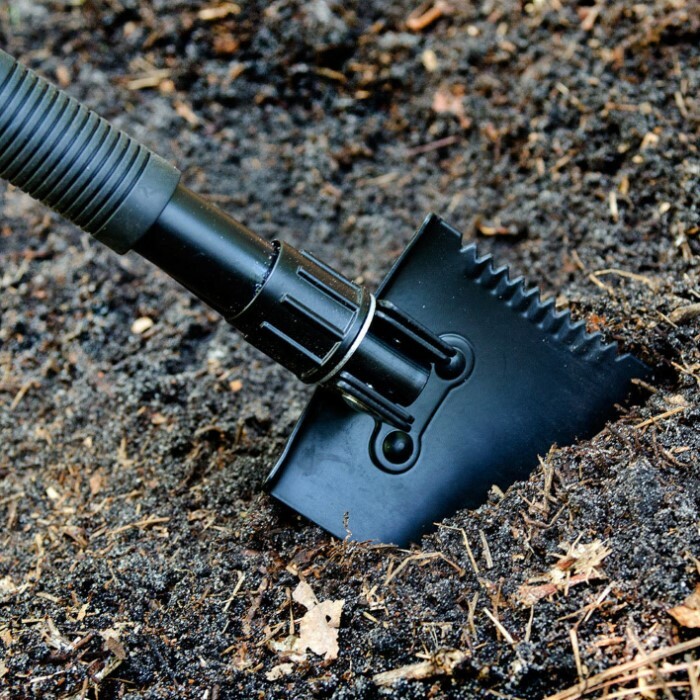 If you want a military spade, buy one, this is not it! Very small shovel, would be ok in garden, digging a small fire pit or picking up dog poop. But digging your vehicle out of snow or mud you will be digging for a long time. Does fold up and fits compact in it's own carrier, but not what I was expecting. Guess I should have paid attention to the specs. Good little shovel for my ATV.